I’ll get back to what I decided in a second. 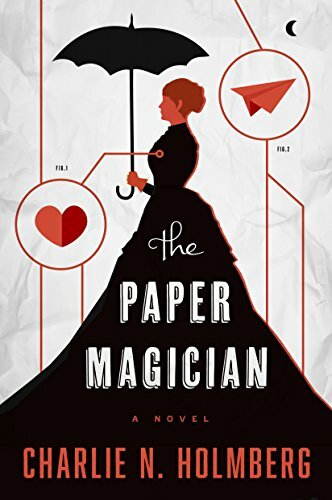 The Paper Magician is a YA (I believe) alternate history fantasy in the Victorian era. Due to the style of writing and dialogue, it feels more like a contemporary setting. I’m a fan of Victorian and Regency novels, so I was a little disappointed that the prose didn’t reflect the style of the time. But, overall, I was okay with that. It may bother others. The first thing that stood out to me was that the magic system in this story felt every bit as good as the magic in the world I was building. Our systems weren’t exactly the same, but it was every bit as magical (perhaps even more so) than mine. Though this novel focuses on a paper folding magic system, you learn almost immediately that this isn’t the only magic system in the world, implying that there may be more books in the series that focus on different magics. This turns out to be the case. Holmberg has written three other novels in this world. Second, Holmberg has a gift for naming. Her character names we fantastic. Ceony Twill and Emery Thane just feel appropriate to the characters. This is something I’m not great at, and I appreciate that skill. I wasn’t in love with the plot. It was fine, perfectly fine. I finished the story, but it didn’t leave me with a strong desire to read the next book. There was nothing particularly bad about the story, just nothing that resonated with me personally. This book just wasn’t written with someone like me in mind. I also didn’t connect too deeply with the characters. The novel was on the shorter side compared to most novels I read, so I didn’t have as much time with the main character as I’d wished I had. I think if I had more time with her, I would have loved her more, and the plot would have felt more meaningful. All in all, this book is good. If you’re curious about it, it’s worth a read, but it’s not a personal must-read. I believe this is Holmberg’s debut novel, so maybe the next novel is even better due to her experiences with the first. Did I dump the world I’d been working on? I decided that because this book doing well, it made sense to put my ideas aside for now. I have other worlds, and I’m in no rush to write stories in this new world I was experimenting with. I still have the notes, and perhaps one day I will return to them if no one has attempted the idea again for a while.